Civil War General and US President Ulysses S. Grant began his adult life with less distinction than one might expect of such a towering figure in American history. After graduating from West Point, he served in the Mexican-American War, where he distinguished himself with courage. After the war, he entered business to supplement his meager Army salary, but failed at multiple ventures. In 1854, separated from his wife and sons, Grant grew depressed, and it was rumored that heavy drinking began to cause him problems, including the threat of a court martial if he didn’t resign. Grant resigned from the Army, and at age 32, returned to his family and embarked on what would be seven years of financial hardship. He tried farming, but was unsuccessful and had to supplement his income by selling firewood on street corners. Upon building his family a cabin, Grant named it Hardscrabble. His wife did not enjoy living there, and when the Panic of 1857 hit, he had to rent Hardscrabble out. Grant then took a job working in his father’s tannery. When the Civil War began, President Lincoln called for volunteers, and Grant helped recruit a company, quickly seeing that the war would be fought more by volunteers than professional soldiers. Although Grant tried to obtain higher command, his reputation for drinking initially stalled him. As the war progressed, however, Grant made a favorable impression on his superiors, and on Lincoln, and rose in the ranks, quickly being promoted to Colonel and then Brigadier General. Grant played a major in role in key battles and campaigns of the Civil War, helping secure the Union’s victory. Many historians now describe him as a military genius. When you consider that at the time of Lee’s surrender to Grant in 1865, Grant was only nine years removed from life as a failed businessman selling firewood on street corners, his achievement is even more remarkable. Grant went on to serve briefly in President Johnson’s administration and then served as President for two consecutive terms. 1922 marked the 100th anniversary of Grant’s birth, and to mark the occasion, commemorative coins were commissioned. The obverse shows a portrait of Grant that was adapted from a photograph by famous Civil War photographer Mathew Brady. 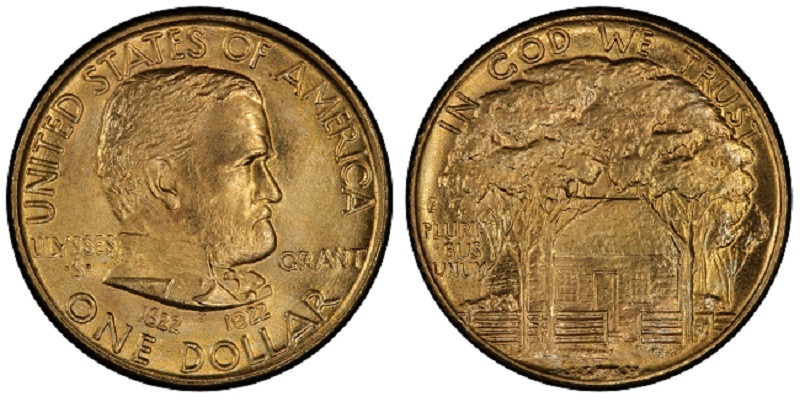 The reverse depicts the home Grant was born in, framed by a fence and trees. In order to sell out the coin, the association commissioning the coins asked for two versions of the coin: one with a small star on the obverse and one without. This created two versions for collectors to pursue, and both issues did indeed sell out, many to wholesalers. Ten thousand gold Grant dollars were minted, and this low mintage ensures that the coins are still rare today. Many of the surviving coins are in good condition, probably because many went straight from the Mint to dealers. Interested in adding this, or other rare coins to your collection? Blanchard and Company has been advising individuals on how to protect and grow their wealth for over 40 years. Contact us at 1-800-880-4653.